The first all-new 2019 Subaru Ascent rolls off the assembly line. See how many are already pre-ordered. The first 2019 Subaru Ascent 3-Row family hauler rolled off the assembly line in Lafayette, Indiana yesterday. Subaru Corporation is building the largest vehicle they’ve ever produced at their U.S. plant, Subaru of Indiana Automotive Inc. (SIA). Yesterday, as the first American-made Ascent rolled off the line, SIA and company executives held a line-off ceremony with President Eiji Ogino in attendance. The new Ascent is Subaru’s all-new 7-8 passenger SUV the Japanese automaker developed exclusively for the North American with active families in mind. Subaru asked U.S. dealers for their input and what families in North America wanted after the failure of the Tribeca which was too small. Subaru Corp says pre-orders for the Ascent family hauler have already surpassed 4,500 units ahead of its launch in early summer. Based on early orders, Subaru may not be able to build enough of the new Ascent 3-Row crossovers to satisfy the demand for the new flagship model in the U.S. and Canada. Subaru is expecting the new Ascent to be a big hit with North American families and they could sell more than 60,000 of the new family-sized SUVs in the first full year alone. Subaru figures to cash in on the SUV/Crossover craze that is driving their sales to new records every year. Subaru could sell more Ascents than their new Impreza compact and Legacy sedan that are also built at their plant in Indiana. Ascent will compare favorably in size and V6 power to Ford Explorer, Honda Pilot, and even the Chevy Tahoe. The SIA plant has already undergone a major expansion nearly doubling production capacity. This year, they are set to produce 342,000 Subaru vehicles, which in addition to the Ascent, the production includes the Subaru Outback wagon, new Impreza compact sedan and 5-Door hatch and the Legacy sedan. 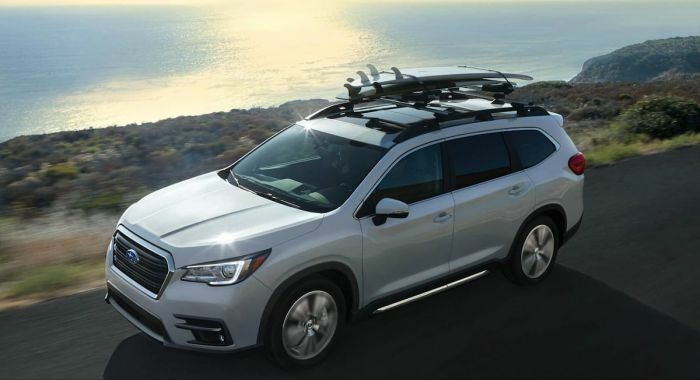 The all-new 2019 Subaru Ascent will be available for sale in the U.S. and Canada in mid-2018. Leave your comments below, share the article with friends, and tweet it out to your followers!